I simply love to decoupage things. Thus far, I’ve done many decoupaged glass bottles. I did not have time to write about them all. But lately I have gotten few cheap spoons at the flea market, just the regular metal spoons. I got them little over 0.1$ a piece. Here is what came out of it. It’s one of my creative decoupage ideas for upcycling. First, I have decoupaged the spoons. Here is how I’ve done it. I painted them with a simple white acrylic paint and let them dry. Then I applied the napkin with the transparent polish. Then I decoupaged the frame. I used napkins with very bright and saturated colors. I used the same napkins both for the spoon and frame decoupage. 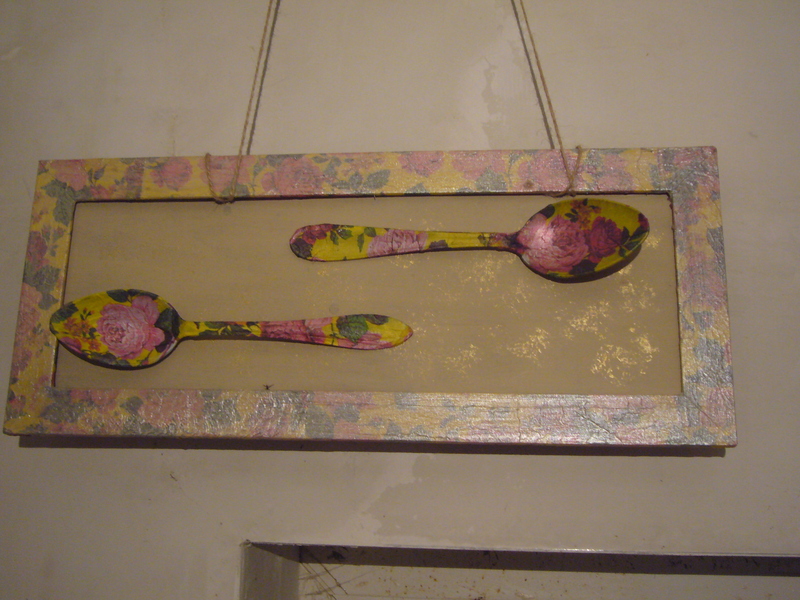 However, I wanted the decoupaged spoons to stand out on the background of the frame. So, here is what I’ve done. I have decoupaged the frame with the napkins and then repainted it over the napkin layer with a very ‘thin’ paint. I.e. I have added much water into the paint. I let it dry for 5 min and then wiped the paint off the decoupaged frame. It makes it look older and worn and faded the colors a bit. I glued the decoupaged spoons into the picture. That’s it. This entry was posted in Crafting Tutorials, Decoupage ideas, Uncategorized and tagged crafts, decor, decoupage, decoupage how to, DIY, glue, handmade, handmade picture, home decor ideas, napkins, paper crafts, picture decoupage, spoons decoupage, upcycling, vintage, Vintage picture: spoons' decoupage and frame decoupage. Bookmark the permalink.